I enjoyed this informative book. It highlights that children matter lots. The chapters on Children in the Bible and Children and Faith Communities are very informative and inspiring. The back blurb says: Children today are no longer expected to be “seen and not heard,” yet in many churches children are involved only in programs specifically designated for them. Children Matter offers a full discussion of children’s spirituality and shows how the faith community can better nurture its youngest members. Just google Lost Sheep resources. 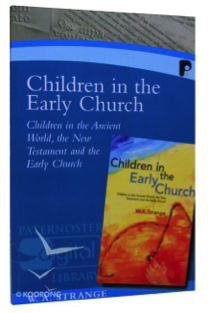 A comprehensive study by New Testament and early Christianity specialist W.A Strange on the place of children within the early church. It must also be understood that the views of children and childhood that we have today are in many ways different than they were in Biblical times. (1) For example, in the time of Jesus, when a Jewish boy reached the age of 12 he was considered a member of the adult community(2) and was completely responsible for his actions. (3)Children were considered as some of the weakest and least privileged members of society.